Given the advanced state of driverless technologies and the amount of money being poured into the sector, there is little question—make that, no question at all—that within 10 years, driverless cars will be the norm. The implications are immense and widespread. There are currently about 1.4 billion cars on the road. Many of those cars, and eventually all, are going to be replaced by self-driving vehicles. Car sharing is already growing in popularity. When getting a ride someplace is as easy and inexpensive as ordering an automated Uber, we can expect a significant percentage of people to realize car ownership is a thing of the past. The companies that take the lead with the best and brightest self-driving cars will do very well. Those that are late to the game or fail to impress will soon dry up and blow away. As I said above, my research leads me to believe that there will be 10 million self-driving cars on the road by 2020, with one in four cars being self-driving by 2030. But I think those estimates (especially the one for 2030) are too conservative. That’s because the technology adoption cycle has been steadily compressing. 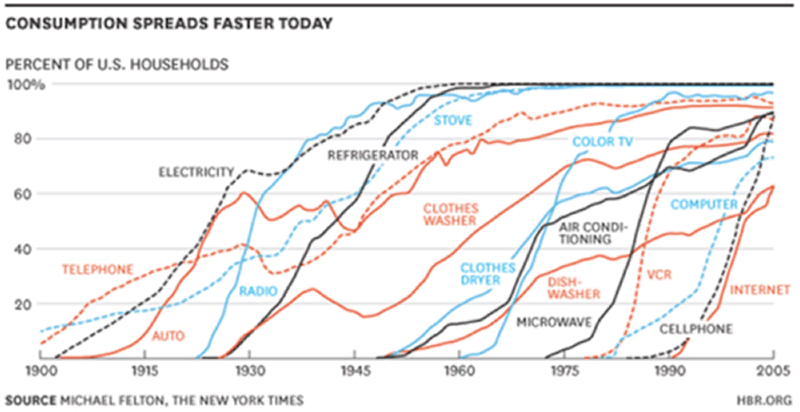 While it took approximately 50 years for electricity to be adopted by 60% of US households, it took cell phones only about 10 years and, though it’s not shown on the chart, smartphones only about five years to reach the same penetration. Once the first self-driving cars go on sale, who will want to buy an obsolete manual driving one? It would be like eschewing a push button telephone in favor of one with a rotary dial. Who would do that? In addition, given the recent improvements in safety, it will only be a matter of time before the manual driving of cars is outlawed, outside of hobby clubs and race tracks. Car manufacturers. Car sharing is already growing in popularity. When getting a ride someplace is as easy and inexpensive as ordering an automated Uber, we can expect a significant percentage of people to realize car ownership is a thing of the past. The used-car industry. There will be a big play here, recycling all the obsolete cars, perhaps in the early days by selling them to third-world countries, or rendering them into their raw materials and selling them. But the overhang of used cars no one will want is going to be seriously disruptive. Of course, companies could offer retrofitting services to turn regular cars into self-driving ones, but once the new generation of purpose-built self-driving cars arrives that uses the space currently dedicated to the driver to create a lounge-like environment for the passengers, I think the demand for retrofitting will die a quick death. Insurance companies. The data so far suggests that the introduction of self-driving cars will reduce the number of traffic accidents by upward of 90%. Lots of consequences here, including redefining the whole idea of personal car insurance. Automobile repair shops. 90% fewer accidents means a lot less revenue for the 500,000 or so automobile repair shops. It will also give rise to a new industry in repairing automated cars, and specifically the technology that makes them tick. Trucking. On the positive side of the equation, companies will benefit from greatly reduced costs for transporting their goods; fewer accidents will lead to lower insurance and legal costs. On the negative side are the 3.5 million US truck drivers, many of whom will soon be unemployed. Human transport companies. Again, good for reducing business expenses, bad for the million or so total taxi, Uber, and bus drivers. Parcel delivery companies. Not so good for the drivers, but it could provide some interesting opportunities for the parcel delivery companies that extend beyond saving on the cost of the drivers. For example, the idea of automated shopping and home delivery becomes much more viable. With the need for personal garages no longer necessary for many, maybe those will become automated delivery bays for stuff you order that can be dropped off while you are not home. Tire manufacturers. A more consistent—and lower—rate of speed will cause tires to last longer. In addition, given driverless cars can’t change their own tires, expect new run-flat tire technologies to be introduced. Car interior design. Without the need for a driver, expect a shift in car designers’ focus toward more comfort and luxury in a complete rethink of car interiors. Senior and disabled mobility. As it now stands, once a person reaches a certain age they can no longer drive, or shouldn’t, which is greatly restricting their mobility. With automated car services, that issue vanishes. Hospitals and emergency services. Every year in the United States, 1.3 million people are injured in car accidents, with about 40,000 fatalities. A 90% reduction in accidents means saving a lot of time and resources for all of the links in the emergency response chain, from police being called to accident sites, ambulance drivers, emergency room doctors and assistants, etc. Parking, Part 1. Why would anyone drive themselves into a city and waste time and money looking for parking, when they could be delivered to their destination in comfort by a self-driving Uber and wave goodbye to the car as it drives off? This means less traffic congestion, less need for parking space, but also a drop in city revenues from parking meters and parking tickets. Parking, Part 2. The people who insist on owning their own car, perhaps because it offers a superior level of comfort, still won’t want to deal with parking. 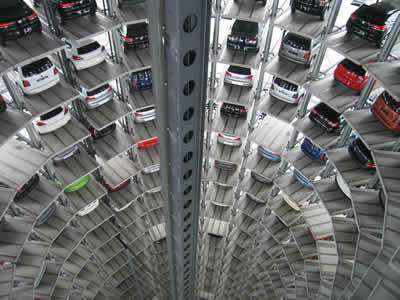 That gives rise to new technologies that enable self-driving cars to search for available parking spots on a nearby street, as well as a new breed of high-tech parking garages such as are now being opened in places like China, Germany, Japan, and elsewhere. While there is much misconception about the impact electric cars have on carbon emissions—because the power required to charge a car has to come from somewhere—self-driving cars should all but eliminate the use of gasoline for driving. The big drawback to electric cars is the charging time, but in a world where your car can deliver itself to the nearest charging station while you are otherwise occupied will greatly change the dynamic. In addition, refueling with gas becomes problematic for self-driving cars. It would be much less of a challenge, say, to pull into an automated charging bay and have the battery pack swapped out. Fortunes will be made in delivering these sorts of innovations. The Military. Without the need for a driver, armored and armed vehicles can be sent into dangerous places to hunt down any enemy combatants that survive the swarms of killer drones leading the charge. In addition to a drop in fees and penalties related to human driving, governments are going to have to rethink the entire road system. In time, they should come around to supporting the technology, because the clear safety benefits will steamroll any bureaucratic foot dragging. Networking/Privacy. To gain the maximum efficiency of the technology, cars, parking bays, roads, and people are all going to have to be networked. Say goodbye to traffic congestion, which is invariably created by human action that will be avoided when all of the cars operate in concert. When you call your SD Uber, it will already have your payment information, as will the owner’s network of parking garages and automated battery pack replacement services, all of which will stay in constant communication so that the services can be delivered seamlessly. The whole notion of a DUI will go away, freeing people up to visit their favorite restaurant for a more relaxed evening out, without having to worry about having the extra glass of wine. Liquor sales should do better as well. At the end of the day, the biggest impact will be on the daily lives of hundreds of millions of people around the world. Imagine, for instance, the benefit of eliminating traffic congestion. We all know people who spend an hour or more each day commuting to work in miserable circumstances. With driverless, networked cars, the whole idea of rush hour will be banished to the history books. That will take the one-hour commute down to, what, 20 minutes? In turn, it broadens the lifestyle options for workers. Live further out in the country? Many will opt to stay in the cities, since they will undergo a fundamental change as gas cars are eliminated and streets are freed from the clutter of parking. Finding suitable companies to invest in that are poised to profit from the advent of game-changing technologies is always a challenge. That’s because so many of the players will be large. Alphabet (GOOG), for example, appears determined to be a leader in the field. How big of an impact its self-driving car division will have on its bottom line—and investment performance—is hard to determine at this point. There are some interesting smaller, but not small, companies doing solid work in the sector. Mobileye (MBLY) focuses on making the software and camera interfaces that allow self-driving cars to operate. The company is making money and has a lot of cash, but with a P/E ratio of 157, it is not exactly cheap. And with a deep-pocketed competitor like Google in the space, the company could end up as a casualty, rather than a beneficiary, of the creative destruction. The car companies that appear to be leading the charge include Tesla (TSLA), whose car models still feel to me like modern-day DeLoreans. Mercedes, Audi, and Volvo are all dedicating massive amounts of resources to the technology. The big US manufacturers seem to play catch-up, though General Motors (GM) is moving most aggressively into the space. Of course, you can’t count out the Asian powerhouses of China, Japan, and South Korea. The Chinese, in particular, have a big advantage in that their government will be far more willing to keep the regulatory controls to a minimum in what is the equivalent of a new space race. At this point, I’m more interested in the not-so-obvious investment opportunities that will arise around the edges of the revolution in how we interact with our cars. One idea would be to identify quaint towns that, as the crow flies, may be 40 minutes from a major urban center, but where congested traffic currently makes the commute two or even three times that long, and where property prices are still cheap. But that is just scratching the surface on an imminent development that has the potential to be as disruptive as the widespread adoption of the Internet. Certainly worth spending a bit of time reflecting on. The P2P lending technology is turning the traditional banking industry upside down. With almost no effort and risk, you can join the revolution in minutes and earn market-beating yields on high-grade P2P loans. Grab our free report, Welcome to the Bank of You, and learn everything you should know about P2P lending to get started. Click here to download. Garret/Galland Research provides private investors and financial service professionals with original research on compelling investments uncovered by our team. Sign up for one or both of our free weekly e-letters. The Passing Parade offers fast-paced, entertaining, and always interesting observations on the global economy, markets, and more. Sign up now… it’s free!